Today’s craft was inspired by one of those moments when you have an idea for a gift for someone but you cannot source it locally. I did find something similar on-line but decided since I had the tools, I’d like to try to make them myself. You will need a die cutting machine for this (I have a Cricut Explore Air) and an iron or in my case a Cricut Easy Press. Don’t be disheartened there will be information at the end of the post on where you can buy them already made (from yours truly). The socks I decided on came in a pack of three. I really like the red band at the top. I measured the area where I wanted to put the words on the soles of the socks and my work area turned out to be 3″ x 5″. I sat at my computer and in Cricut Design Space I used two rectangles as my guide and arranged the text to my liking – the font on the above socks is Cricut Sans. I like it but wanted something a bit chunkier so on the next two pair I made I used the font -Boink Com. I really like the fact the meaning is the same regardless of what order you put your socks on. 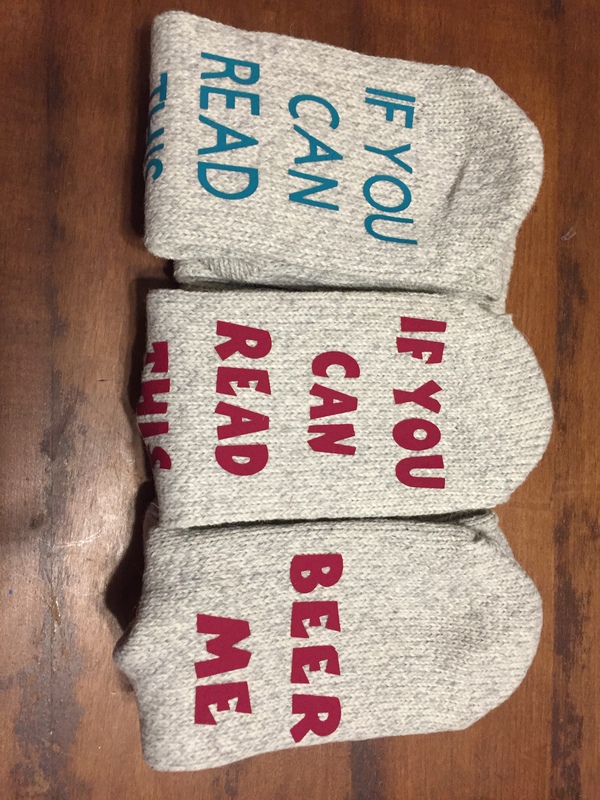 If you don’t want to read the rest of the instructions and just want to know how to buy a pair of these fabulous custom made socks skip to the end… for anyone who wants the full instruction keep reading. Once I was happy with my design, I put my Cricut Iron On Vinyl shiny side down on my green Cricut cutting mat, and hit Make it. At this point it will show you the layout of how your image will print. With iron-on vinyl be sure to MIRROR your image so that when it cuts and you weed (removing all the stuff you don’t want or need) your image it will be positioned the right way on the transfer tape. Once you’ve cut your image and weeded it, you will end up with your image ready to press onto your project, in my case the socks. I did flatten out the soles of the socks and press each one before I placed my image. 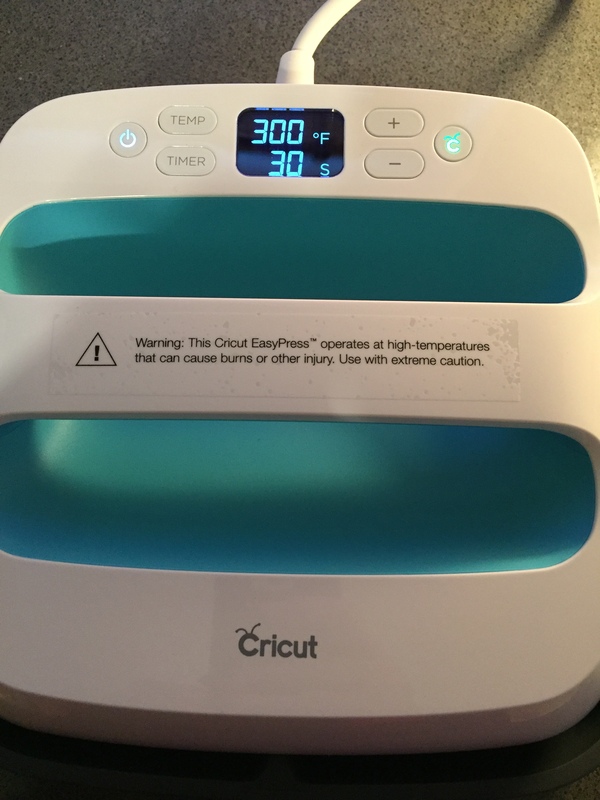 Below is a picture of the temperature I used on my Easy Press for these socks. I also timed it for 30 seconds, which I think was perfect. I did a hot peel of the transfer tape, be careful though as it is, well, hot. I also used a teflon sheet between the socks and the Easy Press – you could also use parchment paper. I truly love the way these turned out and from design to press it took just under 30 minutes for three personally designed gifts. It’s A Wandaful Thing. 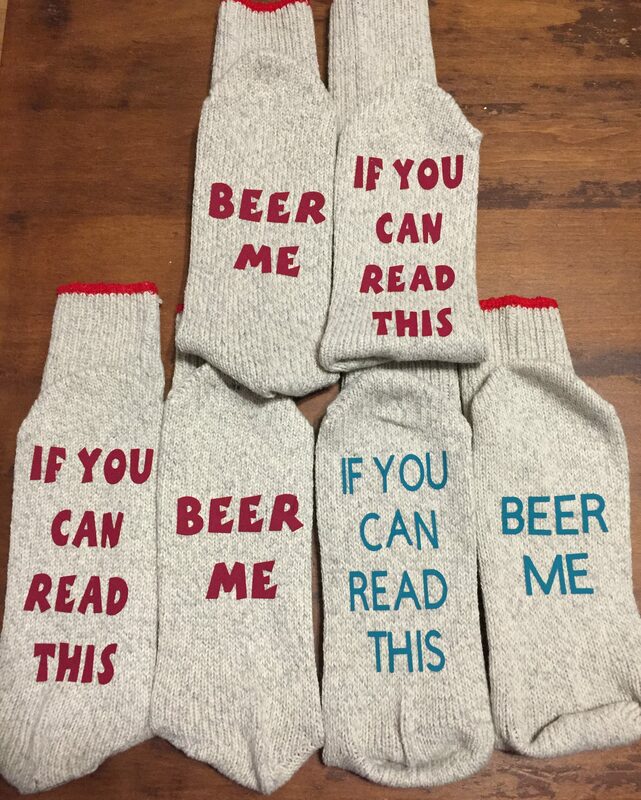 If you would like to purchase a pair of these custom-made socks, I will be selling them for $13.00 tax included + shipping, different sayings available. Orders must be received by December 10 to ensure delivery by Christmas. 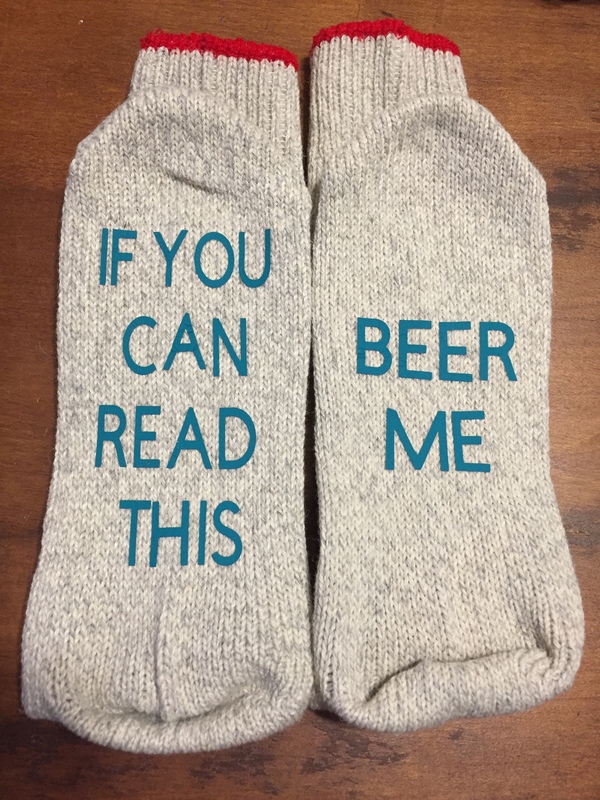 This entry was posted in 12 Days of Christmas, challenge, DIY, Make and tagged 12, 12 Days of Christmas, Beer Me, challenge, Christmas, Crafts, creativity, cricut, Decorate, DIY, easy, Easy Press, If you can read this, socks, under 30 minutes. Bookmark the permalink. They are great. Also neat idea to personalise on them pretty well anything.